About Mombasa Ship Chandlers Ltd.
At Mombasa Ship Chandlers we take a personal approach to Ship Chandling. We believe the best way to meet customer demands is by forging long-term relationships and gaining a deep understanding of specific customer needs. That is why we make certain that our teams are comprised of experienced specialists, equipped to provide services across the spectrum of major and minor bulk commodities. 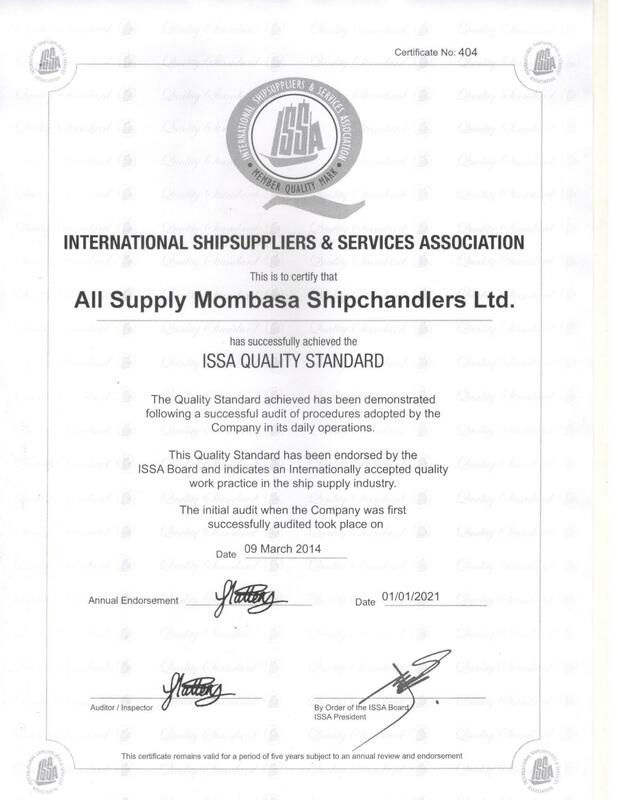 We are proud to boast that we are the only dedicated Ship Chandlers in Kenya awarded with the ISSA Quality Standard Mark. We take our Quality Management System to heart to ensure that we are constinuously deriving improvement based on vigorous quality checks and valuable customer feedback. The pride of our company is built upon always keeping our promise and upholding a long withstanding integrity and goodwill handed down through the generations of the Mombasa Ship Chandlers family. Our second generation has been well guided by our predecessors to promote honesty and tenacity within and out of the workplace that we believe, in turn, will empower us to offer an exceptional quality in our customer service, and a supply experience to match. Established over four decades ago, we became full ISSA members in 1999. To set the highest standards of ship supply in East African Ports through efficiency in our supply cycle and strength in stakeholder relations.